Tripp Lite's 16 ft. high-speed HDMI cable securely connects HDMI-enabled laptops, tablets, PCs, Blu-ray players, game consoles or satellite/cable TV boxes to HDTVs, HD monitors, projectors or home theater receivers. The gripping connectors help ensure components stay firmly attached to avoid viewing interruptions. Common in home theaters, HDMI allows uncompressed digital video and multi-channel audio signals to travel together in a single cable. This Tripp Lite 4K HDMI cable provides a pure digital connection that supports UHD video resolutions up to 3840 x 2160 (4K x 2K), including 1080p, for crystal-clear picture and sound. It is backward compatible with previous HDMI generations, allowing use with lower resolution HDMI components. Specially designed male connectors firmly grip the HDMI ports on your equipment to help prevent accidental disconnection and signal disruption. With greater port retention than typical HDMI connectors, the gripping connectors resist vibrations that can loosen connections over time. This is especially helpful for ensuring components stay attached in difficult-to-access installations. 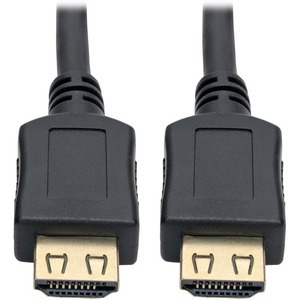 The gripping connectors are compatible with any full-size HDMI port. High-quality materials ensure outstanding performance throughout the cable's lifetime. 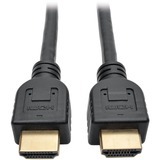 Contacts and connectors are gold-plated to resist corrosion, and double shielding reduces line noise (EMI/RFI) that can disrupt signals traveling through the HDMI cord. 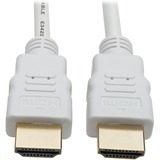 Tripp Lite P568-016-WH High-Speed HDMI 4K Cable (M/M), White, 16 ft.